A trusted name in hair care, Keranique® developed this clinical strength supplement to support and fortify scalp and hair health. 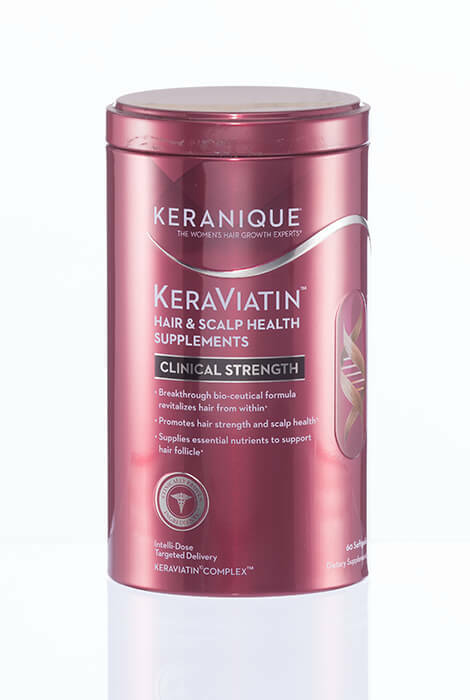 Keranique® KeraViatin™ Hair & Scalp Health Supplements are enriched with a powerful blend of B vitamins, minerals, micro-nutrients and phyto-nutrients. The result is a supplement for hair thinning that works from the inside out to nourish thinning hair and restore beauty to your tresses. To use, take two softgels once daily with a meal, for a minimum of three months. Take 2 softgels once daily with a meal. Take for a minimum of 3 months. Vitamin B1 (as Thiamine Mononitrate), Riboflavin (Vitamin B2), Vitamin B6 (as Pyridoxine Hydrochloride), Vitamin B12 (as Cyanocobalamin), Biotin, Pantothenic Acid (as Calcium Pantothenate), Zinc (as Zinc Gluconate), Selenium (as L-Selenomethionine), L-Taurine, L-Cysteine, Bamboo Shoot/Stem Extract, Keraviatin10 Complex,Gelatin Capsule (Gelatin, Glycerin, Purified Water, Annatto), Sesame Oil, Yellow Beeswax, Sunflower Lecithin.